Unique looking BlackBerry 9670 clamshell is going to be named the "Style"
We knew that it was only going to be inevitable before RIM finally decided on finding an appropriate name for their upcoming unique looking BlackBerry 9670 clamshell. Some thought that it could somehow fit into one of their existing line of BlackBerry smartphones – such as the Curve or Pearl. 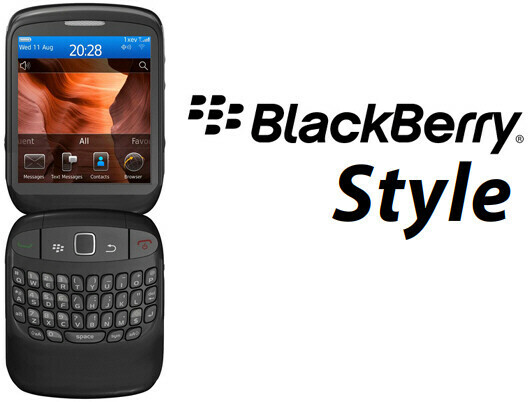 However, the strangely different smartphone is going to be graced with the name BlackBerry Style. Yeah, it can somewhat be considered as a stylish handset with its uncanny design that doesn't necessarily exude similarities to other prior handsets – especially when it looks like wider than the Pearl Flip. Love it or hate it, the name is pretty much going to stand still – so we'll have to just live with the knowledge of knowing that it'll be the “Style.” In a way, it undoubtedly differentiates itself from previous handsets and could be looked as being stylish in some way. Thats gotta be one of the ugliest blackberry's ever. I'm just not feeling this one. The pearl flip didn't do too well, why would this? because it's not the flip. If they put a reflective mirror surface on the top half and some make-up on the bottom half, it could be useful for the businesswoman on the go. Nevermind.....just call it the BlackBerry Junk.